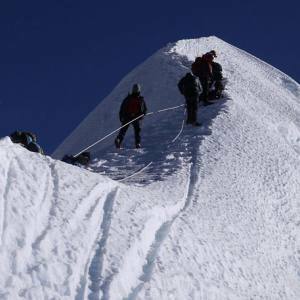 Mera Peak Climbing is a well admired package in the Nepal peak climbing lists. It is highly rewarding trip that leads you through the isolated Khumbu valley and finally offers incredible experience of summiting the Mera Peak (6476 meters), which is the neighbor of five 8000 meter peaks, including Mt. Everest, Lhotse, Makalu, Cho Oyu and Kanchenjunga. These scenic peaks can be explored from a closer distance and capture on your camera. This is adventurous on the one hand and brilliant trip for photography on the other. The Mera peak climbing itinerary begins from Lukla airport; it crosses the Zatra La Pass (4600 meters) and walk through the Hinku valley to the Mera peak base camp. The altitude of this peak is highest among the trekking peaks in Nepal. The route of Mera peak climbing is long and always dominated by the snowy heaps. 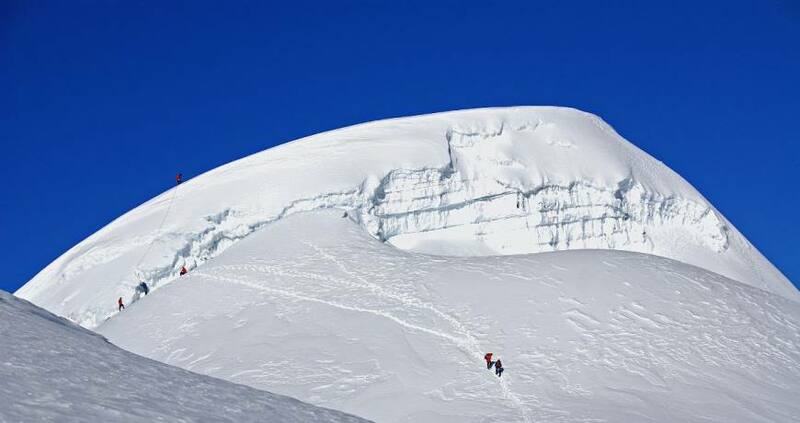 So, ready to deal with the adventure of climbing the Mera peak? Nepal Kameleon Holidays takes care for the rest arrangements. Please, feel free to contact us for more details. Day 01: Arrive at Kathmandu (1350m). Day 03: Fly to Lukla (2800 meters) 35 min, walk to Chutanga (3450 meters) - 4 hrs walk. Day 07: Acclimatization at Tangnang. Day 15: Fly from Lukla to Kathmandu. Day 16: Bhaktapur sightseeing and farewell dinner. Day 03Fly to Lukla (2800 meters) 35 min, walk to Chutanga (3450 meters) - 4 hrs walk. Day 15Fly from Lukla to Kathmandu. Day 16Bhaktapur sightseeing and farewell dinner.